The approach to the Lienz Dolomites holiday region is a holiday pleasure in its own right. 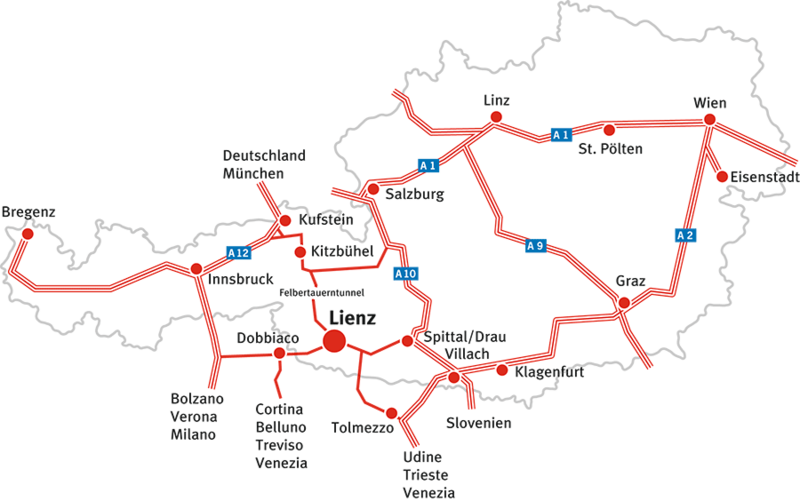 Drive along the Felbertauern Panorama Route in the north – fast and with no tailbacks; through the fertile Puster valley in the west; over the historic Plöcken pass in the south; or through the lovely Drau valley to the east. Motorcyclists love coming here via the Grossglockner High Alpine Road or over the famous Dolomite passes. Don’t forget to calculate a little extra time for some of the many superb photo motifs along the way. Or take things easy and travel here by train. One way or the other, the strategically unique location of Lienz guarantees you boundless holiday enjoyment. Once in Lienz drive towards Bruck Castle. About 150 m past Bruck Castle take a right and drive about 2.5 km on an unpaved road.